A society which runs an observatory claims it can no longer afford to lease the site due to increased costs and charges proposed by a council. Swansea Astronomical Society said it would not renew a rental agreement with the authority over Marina Towers, which the city council owns. It said that a subsidy to help with costs had been withdrawn, while utility and insurance charges had increased. Swansea council said it was disappointing the society was leaving. Marina Towers is home to what is believed to be Wales's largest telescope and a scale model of the solar system. Swansea Astronomical Society, one of the oldest in Wales and a registered charity, has used the building for the last 16 years. But it said increased costs and charges to use the five-storey observatory meant it was unable to afford to renew a rental agreement with the city council. The rent will be £200 next year and will go up to £400 in 2011. It will then increase annually until the figure reaches £2,000 which the council says is the market rate. Brian Spinks, the chair of the society, said the extra rent and running costs would mean the society's members would have to find around £40,000 over the next 10 years. "During the past year the society opened the observatory and its exhibition room on 44 occasions to the public and schools from Swansea and surrounding districts," he said. "On all these occasions the site is manned by a team of volunteers drawn from the ranks of the society. "The members can no longer be expected to finance such a public presence from their annual subscription. "If we had to find £40,000 over the next 10 years it would kill the society. "Why would we want to run an education and tourism centre for free?" Mr Spinks said the society had told the council how much it cost to run the observatory and had seen its accounts before making its decision. "In a sense we cannot blame the council because all these public bodies are strapped for cash," he said. "They have had to say right, we cannot have any of these clubs or societies that do not bring in cash. But museums and galleries exist because there is public money spent on them." 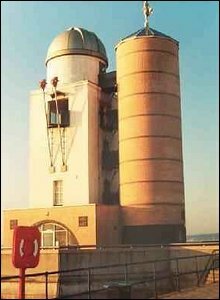 Mr Spinks added that members of the society did not use Marina Towers as an observatory themselves but instead used a private one in the Gower where it was darker at night. He said the society would instead concentrate on this, their lecture programme and other members' activities. The society will be holding its last event at the Marina Towers observatory on 30 October. Swansea council said: "It is unlikely the astronomical society could get anything less expensive elsewhere in the city, so it is disappointing that the society has chosen to leave." The spokesman added that the council had also paid around half the society's heating, lighting and water bills at the observatory. "Ending this concession would have brought the society into line with all the other organisations, charities and community groups in Swansea who rent property with us and are able to make use of our concessionary lettings policy," he said.